Hillsong submits to NAR Apostle Cindy Jacob’s Prophetic Word? Home › Apostolic Council of Prophetic Elders › Hillsong submits to NAR Apostle Cindy Jacob’s Prophetic Word? We wish to remind our readers of Hillsong’s New Apostolic Reformation background and its New Order of the Latter Rain heritage through its founding NAR Apostle Frank Houston and Hillsong’s apostolic leadership network. They promote the NAR gospel, the NAR ecclessia structure and the NAR’s false commission known as the Seven Mountain Mandate or the Seven Spheres/Pillars of Society. To claim that Hillsong is either a pentecostal or charismatic church is patently false. It considers itself a movement and as a result, has no accountability structure within its movement, just as C. Peter Wagner reveals in his book ‘Churchquake’. Furthermore, it’s clear the foundation and authority of Hillsong is not the Word of God. While they offer lip service in their statement of beliefs that the bible is “accurate, authoritative and applicable,” Hillsong actually submit to the final authority of their NAR Apostles Brian and Bobbie Houston and anyone who they deem as ‘apostolic”. Over the years we have noted that Bobbie Houston promotes prophetic words from NAR Apostle Cindy Jacobs. 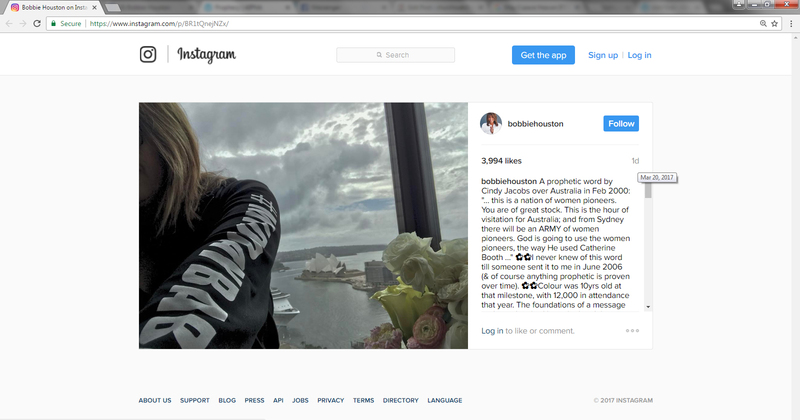 Here is a recent tweet where Bobbie Houston is rejecting the Word of God and replacing it with the ‘apostolic’ word of Cindy Jacobs to mislead thousands of women under her leadership. 🌺🌺I never knew of this word till someone sent it to me in June 2006 (& of course anything prophetic is proven over time). 🌺🌺Colour was 10yrs old at that milestone, with 12,000 in attendance that year. The foundations of a message and mandate had been laid and the “spirit of Sisterhood” as a Army of everyday women was taking shape with every year. God was moving. That aside, I share it now as I wait for some coffee in my #middaybabymidday hoodie. Why mention the hoodie? Cos it’s a reminder that we are in a “spiritual fight” for our cities, nations and the families of this world. It’s a reminder that we are (by the grace of God) an ARMY (a troop within the army and unshakable Kingdom of God). Colour isn’t just a pretty experience. It’s the continual inclusive and all embracive empowerment of God’s daughters for “such a time as this”. 🌺🌺😍. God’s plan is for this continent is to take its place among the continents of the earth as the head and not the tail, and we declare that this is so in the name of Jesus. For there’s a new identity to be formed in your hearts for this nation. There is a strength of character, there’s the strength of knowing who you are and no longer will you not know who you are, for I say, ‘Have I not given my Son for you, are you not children of the Most High living God that there is no name greater than my name? I am the bright and morning star. I Am that I Am, and I have given you My Name and I have marked you with it and no longer are you going to be associated with what came, when Satan brought you and tried to destroy your identity, but you’re going to be associated with My Name, says the Lord God. Australia as a Role Model for Ministry Other nations will look to Australia as a role model. I believe God is going to use the Church in Australia as a role model. We need to have fathers and mothers. Without both, we are a barren church. Other nations will look at Australia and say you have learned how to be apostolic and for men and women to be able to flow together in ministry. People will come from all over the world to look at Australia. So you’d better learn how to do that fast! This is a nation of women pioneers. You are of great stock. This is the hour of visitation for Australia; and from Sydney there will be an army of women pioneers. God is going to use the women pioneers, the way He used Catherine Booth. I prophesy to you that God is going to put a deposit of honor in this nation, and respect. And there’s going to be an understanding of honoring and preferring one another, that one day it will be worked into your culture – red, yellow, brown, white, whoever God has called to live here, and one day you will come before the King of Kings and you will know how to truly honor Him. For He is worthy. Holiness to Prepare the Way I sense there is something being birthed in the womb of the Spirit. And the Lord says, ‘I am birthing a new holiness movement in Australia and you are going to see a purging, holy church. I am getting ready to move. I really feel in my heart that God is wanting to clean the Church out because there is too much compromise going on and He is coming back to a pure church without spot or wrinkle. There is alot of shaking, sifting and changing going on across Australia because God is raising up a mighty army that will not stand for anything less but will stand for truth. When the fire of God comes to the church, the fire will deal with the very heart of man and reveal what really lays deep in their hearts, alot of people may even leave church but in the end it will show who will remain faithful to God even to the point of death. Source: By KDHenry, God’s Desire for Australia, Australian Indigenous Prayer Network Associations, https://striktlygospel.wordpress.com/prophecies/, Accessed 20/03/2017.